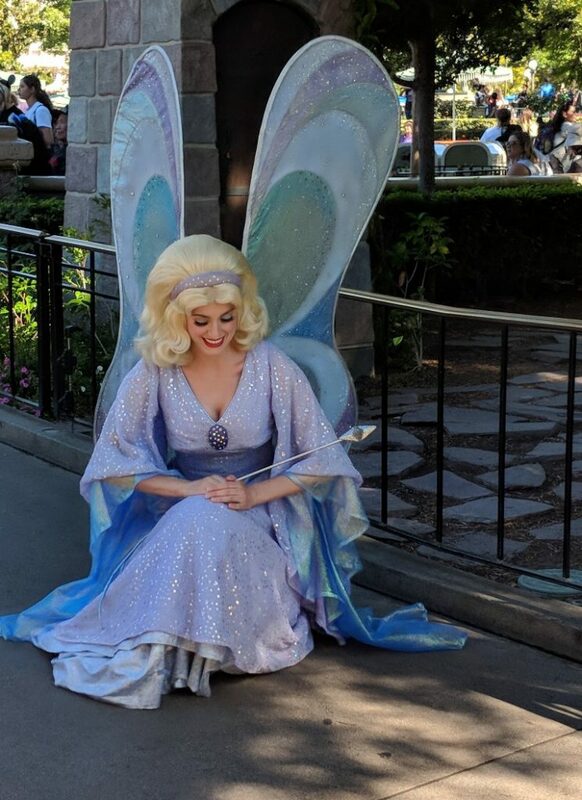 Meeting Disney characters is some of the most fun we have at Disneyland, but finding Disneyland Characters takes a little planning plus a pinch of pixie dust. Find out how to find characters at Disneyland parks and avoid spending your whole day in line waiting to see them. 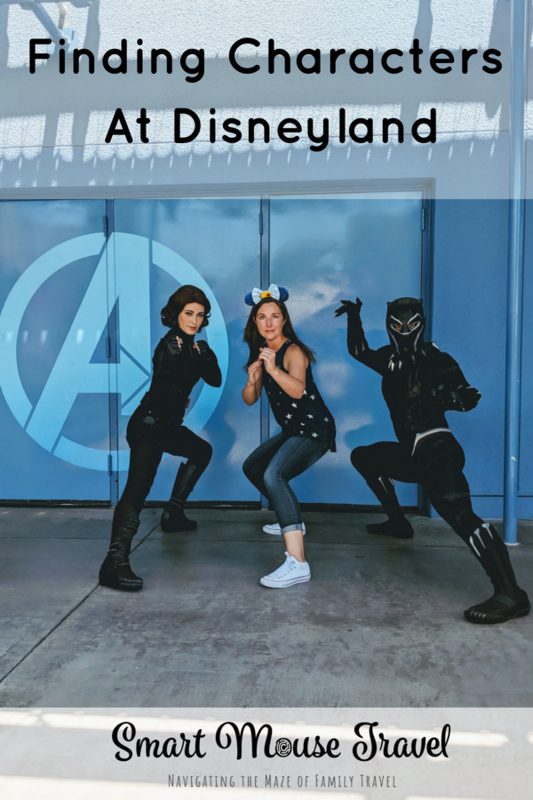 On our first trip to Disneyland we managed to see 14 characters on our first full day, see attractions, and also experience a nighttime parade. Later trips have been just as successful. 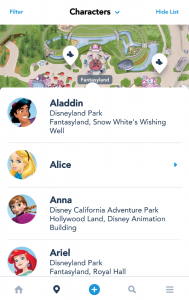 I’ll provide you general tips as well as step-by-step instructions on how to find Disneyland characters using the Disneyland app. If a character is meeting at a random spot inside the park, try to arrive a couple of minutes before the character is set to begin meeting people. A small line that looks out of place is usually a great tip off that a character will be arriving soon. The lines get long very quickly once a character is at the meeting spot. If you are unsure you can always ask a cast member. At Disneyland characters are often roaming the parks. They will generally interact or take pictures, but not sign books while walking. For example, Aladdin gave us high fives while we were waiting in line and Belle spoke to Elizabeth as she wandered around Fantasyland. Disneyland also has lots of character meeting opportunities that are not listed on the app. These tend to be very unique character opportunities so keep your eyes open. If there is a cast member at the end of the line that means no more people may join the line for the meet and greet. It is a good idea to have your autograph book and sharpie (buy on Amazon) ready when you approach the character. This helps the line move more smoothly. 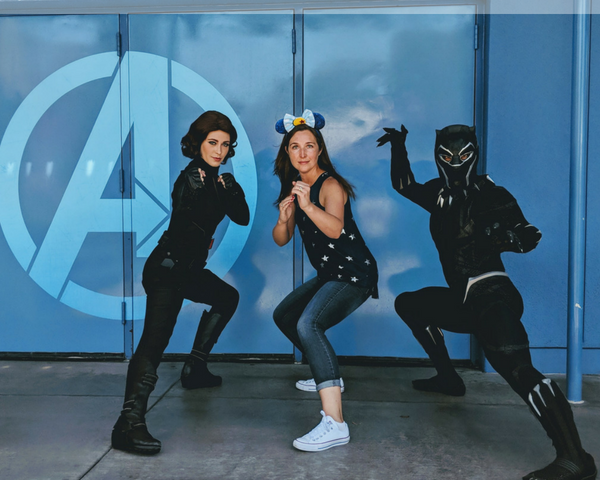 Some characters will have a PhotoPass photographer available, but not all. Make sure that you have a camera ready and always plan to take your own pictures just in case. In fact, Mary Poppins (for some legal reason I don’t understand) never has a photographer there for her character interaction. 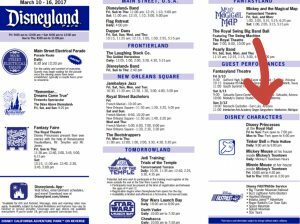 There are two ways to find out where characters will be meeting people each day. This will only provide meeting times and places for a subset of available characters. 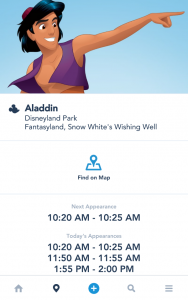 This app is the best option to find character times and meeting places at Disneyland. Once you have downloaded the app you either make a login or use existing Disney credentials. Once you are logged in you can look for specific character meeting options. When you open the Disneyland app this is what you will see. Touch the map portion on your screen. 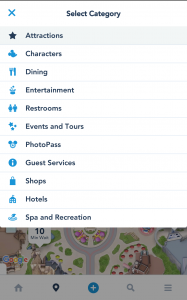 The top center drop down menu will show “Attractions”. Click on it and then choose”Characters”. 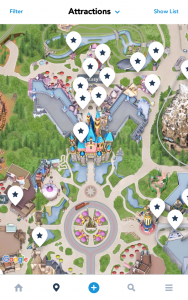 Now you will see little location bubbles around the map with Mickey’s silhouette. This shows locations where characters will be found during the day. 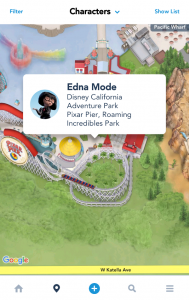 You can drag the map to any area of Disneyland or Disney California Adventure you want to explore. If you touch a Mickey icon it will show which character(s) will meet at that spot. Touch the name of the character and then it will show the times s/he will be at that location. Open the Disneyland app. Touch on the map. 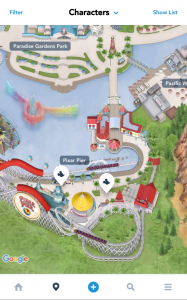 The map will look like this with “Attractions” in the top center menu. Click on “Attractions” and other options will be available. Click on “Characters”. 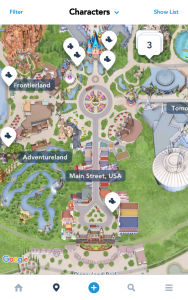 Now you will see a map with the Mickey head bubble icon to show where characters will meet. In the top left corner touch “Show List”. This will switch to a list format. Now you can scroll through a long list of characters. Once you find one you are interested in touch that listing. Here you will see where this person can be found. If they are only available at one spot it will bring up the location and all the remaining times for the day to see this character. 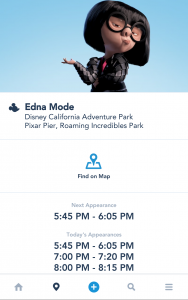 If the character has multiple locations available, choose one and then the specific location within the park and available times will be shown.